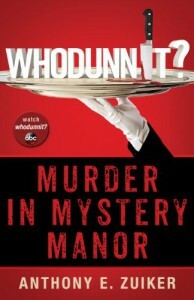 I was mildly interested in the TV series Whodunnit, so when I saw this for free on Audible I grabbed it. I wasn't really expecting much out of it, so I can't exactly say that I was disappointed, but it could have been better. This novel is meant as a prequel to the TV series and introduces us to the show's host butler, Giles. It does not correlate directly with the first season of the show. I enjoyed the beginning part where we learn why Giles comes to the manor, but once the guests started to arrive I started to lose interest. It reads, quite literally, like a novelization of a reality TV show. I'm sure this was intentional, but I can't say the format translates well to paper.